These shortbread cookies have been healthful-ized and have soft tones of rose, complimented with a warm roasted almond finish. A perfect snack to warm your heart! Place slivered almonds on a parchment paper or silicon mat lined cookie sheet. Place on middle rack of oven for 9 minutes, stirring every 3 minutes. Once golden, remove from oven and set aside. Meanwhile, combine almond flour, baking soda, crushed rose petals, and salt. 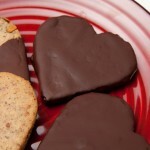 Once almond slivers have cooled, add those as well. Set aside. Combine earth balance, honey, and vanilla extract. Add dry ingredients to wet and mix until combined. Place a 1.5 foot sheet of parchment paper on the counter and roll out dough to 1/4 inch thick. Cover with parchment paper and place in the freezer for 1 hour. After hour has passed, preheat oven to 350F and line a cookie sheet with parchment paper or silicon baking mat. Use cookie cutters to create cookies, placing them 1/2 inch away from each other. Bake for 7-10 minutes [mine were perfect at 8 minutes]. Allow to cool for 5 minutes before dipping in chocolate. Melt chocolate either in a double broiler, microwave, or place chocolate in a metal bowl and place in a larger bowl with boiling water. 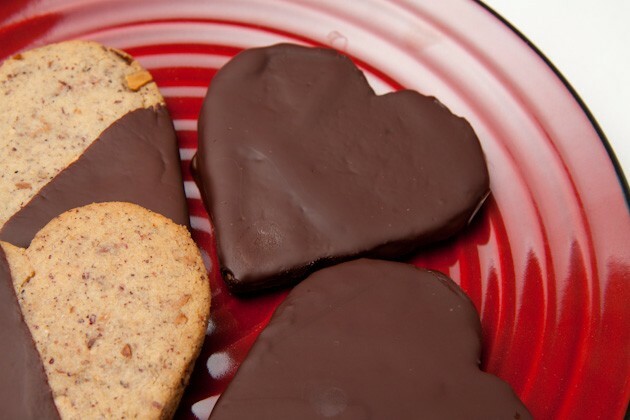 Dip each cookie in chocolate, place on parchment paper or silicon lined counter top.